Provides end-of-chapter homework problems with a focus on engineering applications. This book is aimed at electrical engineering students and faculty staff in sub-disciplines as diverse as power and energy systems, circuit theory and telecommunications. It will also appeal to existing electrical engineering professionals with a need for a refresher course in electromagnetic foundations. J. A. Brandão Faria received his PhD degree and aggregate title in electrical engineering from the Instituto Superior Técnico of the Technical University of Lisbon, where, since 1994, he has been a Full Professor of Electrical Engineering teaching undergraduate and graduate courses in electromagnetics. His teaching activities also include lecturing courses at the Portuguese Air Force Academy. Professor Brandão Faria was a senior scientist with the former Centro de Electrotecnia Teórica e Medidas Eléctricas where he served as President from 1994 until 2000. Since 2008, he has been at the recently created CIEEE (Center for Innovation in Electrical Engineering and Energy). Professor Brandão Faria was the recipient of two Honorable Mentions awarded in 1994 and 2007 by the Portuguese State Department of Science and Technology, and by the Technical University of Lisbon, respectively. His areas of interest include electromagnetic field problems, power lines, and wave propagation phenomena in multiconductor transmission lines. He is the author of two books on electrical engineering subjects, namely Optica and Multiconductor Transmission-Line Structures, and has published over 100 technical papers. Professor Brandão Faria is a member of the Editorial Board of the European Transactions on Electrical Power (John Wiley & Sons, Ltd) and a senior member of the IEEE. Line matching technique using an exponential transmission-line section. Transmission-line system with balun transformer for even to odd-mode conversion. Transmission-line system with transformer-stage matching. 2.2 Gradient Electric Field, Electric Potential, Voltage, Kirchhoff’s Voltage Law. 2.8 Application Example (Two-wire transmission line). 3.3 Current Intensity, Kirchhoff’s Current Law. 3.4 Resistor, Conductance, Resistance, Ohm's Law. 4.2 Ampère’s Law, Magnetomotive Force, Magnetic Voltage. 4.7 Application Example (Three-legged transformer). 4.14 Application Example (U-shaped electromagnet). PART III: SLOW TIME-VARYING FIELDS. 6.2 Displacement Current, Generalized Ampère’s Law. 6.5 Application Example (Capacitor self-discharge). PART IV: RAPID TIME-VARYING FIELDS. 8.2 Poynting’s Theorem, Poynting’s Vector, Power Flow. 8.3 Time-Harmonic Fields, Field Polarization, RMS Field Values. 8.4 Phasor-Domain Maxwell Equations, Material Media Constitutive Relations. 9.2 Time-Domain Transmission-Line Equations for Lossless Lines. 9.3 Application Example (Parallel-plate transmission line). 9.4 Frequency-Domain Transmission-Line Equations for Lossy Lines. 9.5 Frequency-Domain Transmission-Line Equations for Lossless Lines. 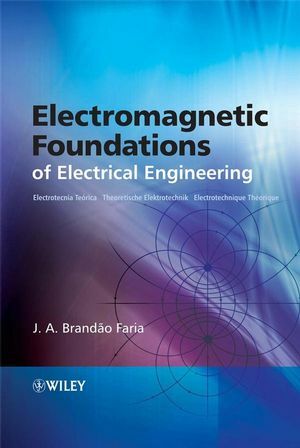 Electromagnetic Foundations of Electrical Engineering Visit the books website for more information and resources.